NORTH LAS VEGAS, Nev. (AP) — Upstart electric car company Faraday Future hopes to have its first vehicles rolling off the assembly line in 2018, a company executive said Wednesday, as officials marked the start of construction on a planned $1 billion Las Vegas-area production plant. Nevada has pledged up to up to $335 million worth of incentives toward the project, which Gardena, California-based Faraday promises will employ some 4,500 people over the next decade. The company, backed by Chinese entrepreneur Jia Yueting, currently has about 700 employees in the U.S. It unveiled a concept car in January, but hasn’t put a vehicle on the market. Nevada lawmakers held a special session in December, just weeks after Sandoval unveiled and endorsed the project, to promise $215 million in tax breaks and $120 million in infrastructure improvements. 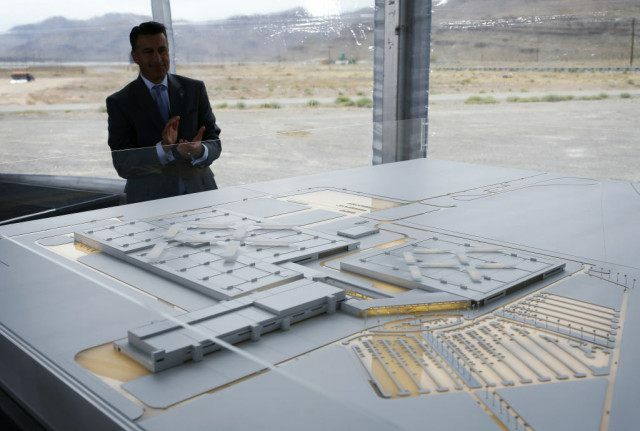 Faraday Future last month pledged to post a $75 million bond toward the development of roads, rail and water lines to serve the 900-acre site at the Apex Industrial Park about 25 miles north of downtown Las Vegas off Interstate 15.